I am having trouble keeping Outlook 2010 as my default email client. After every reboot I have to set it as the default again, otherwise an mailto email links will open Gmail in Chrome. This is on a Windows 7 Professional 64 bit PC. I've tried Googling this issue but all hits appear to only explain how to set Outlook as default (which I know how to do but the change doesn't stick after a reboot. Does anyone know the solution to this? Is there any more information I need to reply to help troubleshoot this issue? You dont have any extensions installed in chrome that handle mail do you? Maybe the problem isn't with your Outlook, but with Google Chrome? It could have registered to have gmail.com registered as the default handler for mailto: links. Open Settings -> Privacy -> Content Settings -> Handlers & have a look. 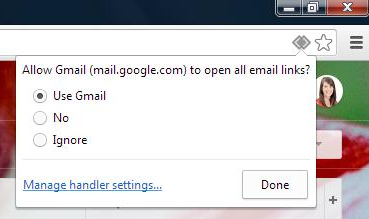 Google Chrome prompting you to change the default handler for mailto: links. Image linked directly from above site. No Chrome extensions that would impact email. Uninstalling Chrome is an option that I'm trying to avoid but is a good one. Thank you. I have tried your suggestion and will see how it goes. Why are you trying to avoid uninstalling Chrome? If you are signed in with your Google account into Chrome itself, your settings & extensions & bookmarks can sync with the cloud. That means after a reinstall, everything will be back to your own envirnment instead of the blank defaults. So far so good after a couple of reboots. Will keep monitoring it. Glad to hear it. Please remember to tick the post as answered when you are happy about the solution.